We bought 3 and are very happy with the look,value and price. Easy to assemble. Pull up a seat at the bar with this Biedermier barstool. The rich wood and classic design elements of this barstool fit in perfectly with your traditional decor in a kitchen, rec room or bar area. Dark faux leather upholstery on the seat adds to the warm, classic look. European craftsmanship with solid beech wood construction ensures a sturdy barstool option for seating in your home. The stool features corner blocking for additional stability. The high-quality leather seat upholstery holds up well to lots of use,so it looks great for years. Lean against the stool back and propyour feet up on the foot rest for a relaxing seating option. Summary 1st: Love the quality & sturdiness, great price, height & style was perfect for our bar, and LOVED the fact that I didn't need to assemble 1st. Now the Details: I was ready to hit the roads to search for barstools at brick & mortar stores, when on a whim, I checked overstock.com. I saw other reviews on the Beidermier Barstool and since it was the exact style and look I was hoping for (dark wood, back, deep & black seat), I decided to take a chance. I placed an order for 4 of the barstools, in walnut. They arrived in 2 days (*wow*!). I opened one and though I loved everything about it - height, quality, seating comfort, etc. --- the color was a little off. No problem with the color itself - I loved it - but when I put it up the the bar, it didn't quite mesh with the granite & cabinets. *sigh*. I recalled reading a review saying the medium oak color had been too dark, so decided to take a chance. Ordered 1 barstool in the medium oak & it was perfect. Yes, it is definitely dark & I would never have thought to call it medium oak, but it was lighter than the walnut and the extra color in this wood was just right for us. I promptly placed an order for 3 more. The down-side is solely my doing & a risk I accept with on-line shopping: had to repack the 1st walnut barstool & then return all 4, eating the return shipping cost (forutnately, the original $2.95 charge was the same as free). I will say the whole return process with overstock.com is painless and return shipping cost was reasonable, I thought. The lesson I learned is next time I order something like this, order just ONE to start - try it out, then order the rest of it works. 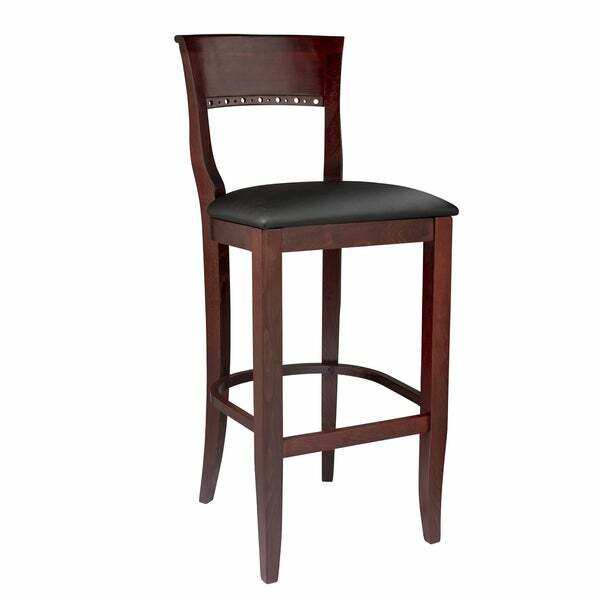 Net: I love these barstools & am delighted with the overstock.com experience. HOPE MANAGEMENT READS THIS REVIEW - I am an O Club member and make my purchase decisions based on customer reviews. From asking questions of customer service reps, they use the customer reviews too. That being said, I have been looking at bar stools for months, and ordered five of these stools. The customer service rep said they could not possibly arrive before the 25th of the month, which was fine as I was going to be out of town for a week. The stools were delivered ten days early and left in the driveway. The description says leather FOUR times when describing the seats. IT IS NOT LEATHER. 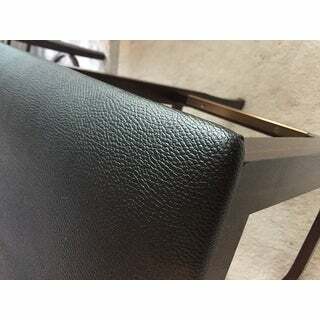 It may be bicast leather or bonded leather but it has a cloth backing and it is definitely not real leather. It may be vinyl, but I am not sure, Three of the five stools arrived damaged. From examining the shipping boxes, it appears that the damage, which consisted of dings and dents in the wood, occurred during shipping, Beech is a hard wood, so the dings were caused by some very rough handling. With some wet cotton balls and furniture pens, I was able to repair the damage to the point of not being noticeable, therefore I kept all of the stools fearing a replacement would be no better. On the positive side, the stools are very sturdy given the rough treatment in transit. They seem to be very well made and the not leather seats have a pebble grain that looks nice . I ordered the oak finish which looks more like the walnut picture as they are pretty dark, but they are brown with no red tones which is what I wanted. The stools seat is comfortable as is the seat back. The seat is also higher than some I have seen, coming in at 32 inched high. I would have given these stools 5 stars if they had real leather seats and had not been damaged. I am pleased with how they are made, how they look, how they feel when you are sitting in them, and I think they will serve me well. One final thought - I have seen these same stools at up to $80.00 more on other shopping sites. Great work Overstock! These Biedermier barstools are great. They are well-made, comfortable and have great detailing. My only criticism is that the mahogany is very red---much closer to a cherry color than a true mahogany. 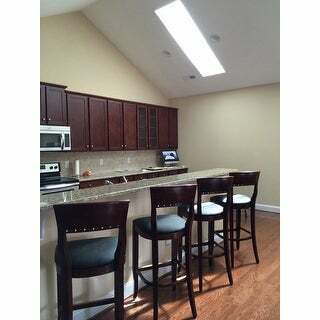 Couldn't be happier with our bar stools - we also purchased 12 dining chairs - the table with chairs are next to the bar stools in our kitchen. We have wanted to having matching chairs for 30+ years - just wish we hadn't waited so long - now the kitchen and adjacent eating area actually look like they belong in the same home! We ordered two of the Biedermier Barstools in Medium Oak finish. They were received in a timely way, nicely packed, and appeared to be of good quality. However the wood tone was not Medium Oak. It was much darker and a warmer brown than medium oak (more like an American Walnut tone) -- didn't have that slightly golden brown tone that all of our oak furniture has. We returned the items immediately because they did not coordinate with oak furniture and wood trim in the family room. We were sorry they didn't work out. Another point. The seat height on these chairs is not stipulated on the web site...they are quite high. Seat surface measures over 32 inches from the floor. So we would recommend these only if the buyer understands these two considerations. We recently finished our basement and elected to put in a home bar. I searched for weeks and finally came across these bar stools. After reading reviews and completing a thorough investigation, I felt like we should give these a try. We purchased 5 of these. The overall quality is exceptional. I will say that the color is more red than a darker mahogany that appears in the preview picture. Keep that in mind. No question about it, definately more red that I thought they would be. I believe this manufacturer also makes a darker version of this color, but it was not available on overstock. Also, there were some inconsistent levels of color on a few of the chairs...some "blotching" in some cases. So if you are particular about the color and the quality of stain, you may be a little disappointed. The weight, strength, size, and stability of the chair is excellent. Some of the chairs have a slight wobble, but that's pretty typical for barstools. The height is perfect for our bar, and the chairs are very comfortable. Excellent value, and the shipping time was incredible. We got them in 3-4 days after ordering. They were also available for much less on other websites, but shipping charges were very steep per chair. I purchased 6 of these beautiful barstools. I had read the reviews and had been concerned about the height. 30 inches was the absolute tallest I could go on the height. I read some reviews that commented on the actual height being 32 inches. Not all of the reviews stated this. I decided to do an online live chat to discuss the height (in the description it stated 30 inches from the floor). The rep assured me the description was correct and the seat height was measured from the floor to the top of the seat. The stools arrived quickly and well packaged. I only opened one and found it to be 32 inches from the floor to the top of the seat. I returned them and was credited for everything except the UPS pick up fee. Great look for the money. I just wish they would cover the seat in a neutral fabric like tan. The black vinyl blends in with the dark walnut wood too much. I had to recover it. I received these today and I couldn't wait to post my review. They came completely assembled and in perfect condition, even though the delivery company was exactly easy on them. I purchased the walnut, even after some posting saying they were darker than expected. They are exactly what I expect for walnut, it is dark. My bar ended up being higher than standard (about 44 inches) and these work perfectly since they are closer to 32 inches. They look beautiful in the house! Great look and quality at a very low price. I’m not sure that the seat is covered in leather. It’s very rough feeling. They will be going back. Seat split after first use. Color nice. .......................... would not order again. The nice thing it was boxed. Will try another stool. It was the correct height. I love these bar stools. I have looked and looked and these were an excellent purchase . The quality and color are just as the picture shows. I get lots of compliments on them. Good chair! Didn't expect much but after 2 plus years still very sturdy and holding up well with 3 sons who are 200 lbs plus. Great chairs for the higher counter top. Have them two years now & going strong. Very sturdy & very stable. Love the color, match my kitchen cabinet perfectly. The leatherette that covers the seat is starting to wear a bit on couple stools but I think easy to replace. Very pleased with these, I own 5!!! Could not be happier with these beautiful bar stools! I did buy the dark oak and they are a great match to my cabinets that have a red hue. After reading the reviews from folks that selected mahogany and it was really red, I was happy with the dark oak. The best thing was they are assembled! Excellent construction-built well, already assembled, color true to the picture. "What is the height of the seat from the floor"
"ilove the look of this stool,however the it does not come in the hieght i need . would the co.that manufactures this stool cut it down to the size i need?" Hello vivb, unfortunately, we are not able to customize this stool. Thanks for shopping with us! "does this product have any formaldehyde? is the product pre-assembled?" Hello di, as far as we aware the products have no formaldehyde & comes fully assembled. Thanks for shopping with us! Great reviews and the walnut finish is very elegant. The fact that its assembled is an extra bonus! "Could you send me an email when the oak finish barstool becomes available, looking to purchase 4 barstools. Thanks." Hello barstool, items are restocked as they become available; however, we cannot guarantee an item will be restocked. Thank you for shopping with us. "When will the oak finish be available for the bar stool." "What is the weight limit for this barstool? Does it hold more weight than a swivel style?" Thank you for your inquiry, cavanaughsl. Unfortunately, we do not weight test our items. Please let us know if you have any other questions. Thank you for shopping with us.